Sometimes you might end up with a machine where the ftp tools are not accessible. 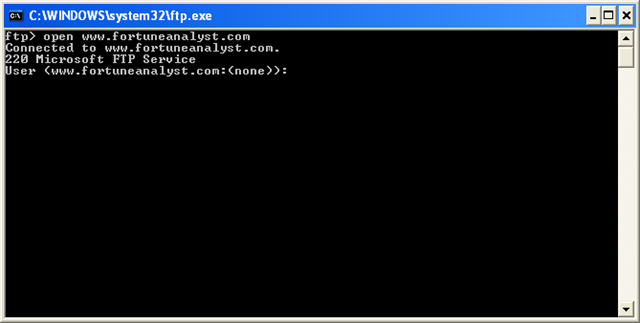 Here we can use the ftp.exe command line tool along with Windows Operating system. 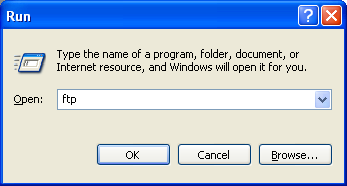 Type ftp in the windows run command box. It will be prompting for the user name and password. Type your username and press enter. Wait for 2 seconds and you will be prompted for the password. Type the correct password and press enter. Wait for 2 seconds and if the password is valid you will be getting the message”User * logged in”. Note: The password typed won’t be displayed on the screen. If you can see the above message Congratulations!!! You have successfully logged in. Type the command dir in the above screen. Wait for 2 seconds. You will be listed with the directories and files in the root folder. Copy files to the new directory. You can ensure you are in the correct directory by entering the dir command again. Here you are uploading a file from the local computer to the ftp site’s current directory. Alternatively you can type put and drag and drop the file from explorer to the command window. So the exact path will be shown correctly. Ensure the file is copied correctly by typing the dir command again. If you can see the file in the command screen you have uploaded the file successfully. Close the command window by typing the quit command. You can use the up and down arrow while in the command window, to traverse between the commands typed. It will save the time and effort to type the command again. We can use the sys.tables and sys.objects to find metadata of tables and columns. The world have started moving from object oriented programming to functional programming. The Lambda Expressions in C# is definitely providing many advantages like reduced code and speed above the traditional programming. Learning Lambda Expressions and the built-in methods in C# is not too hard, but requires sincere efforts. It is for sure that Lambda will reduce the code and execution time. For example consider the case where a list contains numbers from 1 to 10, You wanted to print the numbers divisible by 2. Here we have reduced the code from 3 lines to 1 and the coding efforts too. Above that, it is very interesting to use Lambda expressions. Believe me!! So I would like to start from the first step towards Lambda Expressions – that is delegates. Learning one concept per day would be more easier and give more confidence in using it. Delegate is a type that references a method. Same like a class variable can refer to an object instance, we can assign methods to the delegate variable. 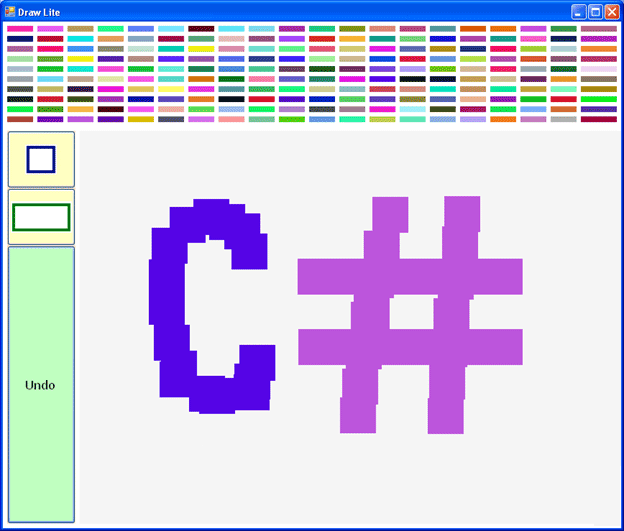 It was a feature introduced in C# 2.0. How it can be helpful? We can use delegates to create a skeleton of a method that would be used by multiple classes. Event handlers can be created using delegates. Anonymous methods were also introduced in C# 2.0 version. Sometimes we run into cases like we have to create a method for assigning to events. In this case, instead of creating a method, we can create inline methods – those are methods without a name. Here button_Click() is the method for the event handler. The same code can be replaced as following using anonymous methods. Please note that the delegate keyword is used to place the anonymous method. In the above code we have saved one method and used inline coding for event handler. This is a step towards our real aim – Lambda Expressions. Let us take another advanced example of Anonymous methods. Here we are creating a custom delegate. The WriteMessageDelegate delegate takes a string as argument and returns void. It can be used as a callback mechanism to write messages globally in an application. Test code is following: Here we are declaring a method named WriteMessage with same signature of the previous WriteMessageDelgate and then passing it to the Do method. Please note that the Do method will be invoking the WriteMessage. If you can understand the above code, Congratulations!!! You have just learned how to use delegates as arguments. A lambda expression is an anonymous function that can contain expressions and statements. All lambda expressions uses the operator =>, which means “goes to”. The left hand side of => represents function arguments. and the right hand side is the statement using argument. Here the “argument” denotes the method argument and the operation on the right hand side. Consider we are having a list of string items. We need to sort them using descending order. So we have to implement the Compare() delegate. Note: All the examples are intended to have System.Linq in the namespace section. Note: The Sort() method actually changes the list, but OrderBy() gives an ordered view only without actually changing the list. For a long time I was wondering about why the xml type is needed in sql server. Following are a few number of advantages on using xml column types which I found implemented in industry. We need to create a Customer table having Id and Name of the customer and the order created by him. An order contains multiple items and at a time the customer is having only one order. You can create the table using Sql Server Management Studio. The Sql Server version which I am using is 2005. Once created the table like above, you can try inserting data into it. If you are able to execute the query successfully. Congratulations! That seems to be a valid the table creation. The above table design is good to proceed but not the best! The user can store any xml in the column that would be difficult for us to parse back. So we need to ensure that only the right format of xml can be stored in the column. We can achieve the above using XSD enabling. The XSD is an xml format definition which says what should be the xml data stored in. If an attempt to save an invalid format the database will throw exception. 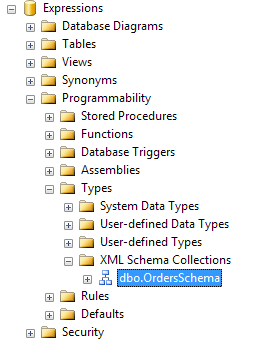 After running the query successfully, you can ensure the schema was created in sql server by expanding the Programmability tree. 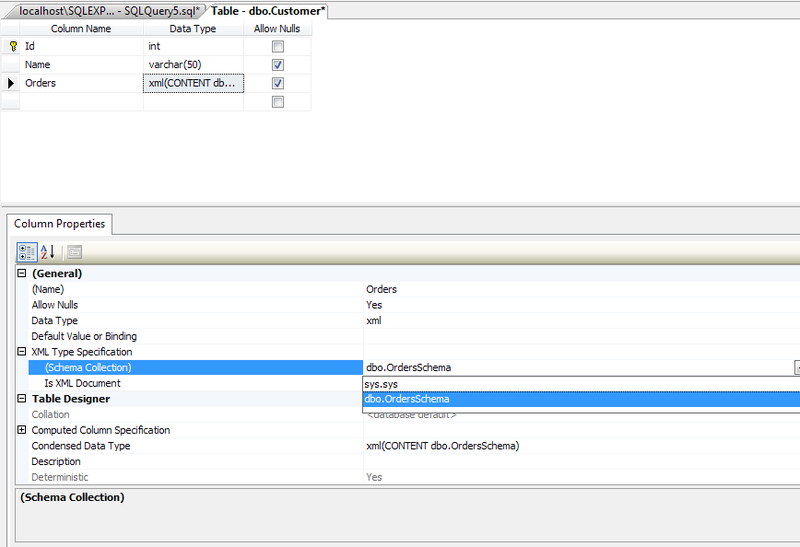 Open the Customer table in modify mode and select the ‘Orders’ column and se the ‘OrdersSchema’ to the Schema Collection property of it. Save the table so that now onwards the XSD validation is enabled. If you get the following results, then You are good. Friends, here I am trying to show the usage of Command Design Pattern, one among 23 design patterns. You are working on a painting application. For each brush stroke you need to provide the Undo feature. The brushes presently available are square and rectangle. In future more and more brushes will be available. Our challenge is to provide the user with Undo feature. Clearly, on clicking the undo button, the last stroke should be cleared from the canvas. The pattern says that all the operations should be converted into objects, so that we log the objects. In future we can call Do() or Undo() operations on the object. The object should be smart enough to store the request parameters inside it to support the Do and Undo operations. SquareCommand class for square drawing operation and Rectangle class for rectangle drawing operation. The Do() operation would be drawing a square for the square class and drawing a rectangle for the rectangle class. We can formulate an interface called ICommand having the Do() and Undo() methods. The classes would be SquareCommand and RectangleCommand which implement s the above interface. When the application is executed, the user will be having a blank white screen, with a set of colors to choose from. The default brush selected will be Square and on clicking the canvas a new square will be drawn on the canvas. The default color selected is Blue and is stored in the variable _activeColor. For each mouse down operation a new square class will be created. That means if 10 clicks are made 10 square classes will be created and the Do() operation is called An enumeration variable called _activeShape is used to keep track of the current shape selected by the user. The mouse down event would look like the following. Let us take an example: assume the user clicked the mouse at Point X=100 and Y=200. As the _activeShape is Square, a new SquareCommand class instance is created with arguments e.X and e.Y. The remaining arguments are bitmap and the active color. Then the command instance would be pushed to a stack and the Do() operation is called. We can have a look on the Square class. Both the SquareCommand and RectangleCommand class will be having same implementations except in the Do() operation of drawing the respective shape. The constructor is called with the bitmap and the x, y positions which are then stored into class fields. When the Do() method is called the current pixel colors are saved into the _colors list. This would enable us to perform the Undo() method later. After that the graphics.FillRectangle() method is called to draw the square. The width and height of the square would be set to 50 pixels using the constants Width and Height respectively. The Undo() method just restores the previous pixel values using the bitmap.SetPixel method() by iterating through each pixel starting from x, y position. As we encapsulated each operation to a class with parameters and logged them into the command stack, it is now easier to call the Undo() method. Please remind that on clicking the Undo button we have to get the last operation instance and call the Undo() method of it, and removing it from the stack. First, the command stack count is checked to ensure there are commands inside it. 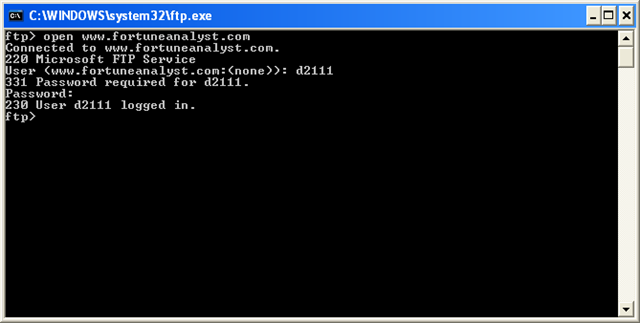 Then the last command is popped out using the Pop() method. It will give us the last instance in the stack as well as removes it. Then, the Undo() operation is invoked. After, the RefreshUI() method is called to update the UI with the changes. The command pattern provides an object oriented manner to provide Undo feature to our application in a flexible manner. But the creation of lot of object instances is one of the draw back of this method which usually people say about. I would say that in the other hand, the command pattern is giving us the advantage of keeping the code more manageable. 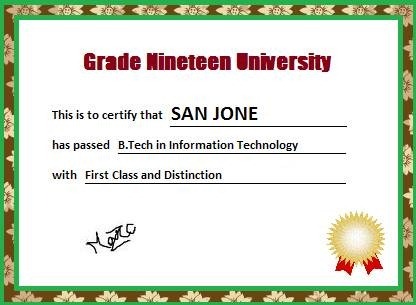 You are a developer at Grade Nineteen University. One of the recent requirments the management had is to create an online certificate. So that the students that pass out should be able to view their Certificates online. This will definitely add some technological edge to the university. · For 1000 students passed out each year it requires 50 MB disk space. · While backing up database of site, we have to do backup of jpg files too which is tedious. If we have to take a backup of the site, we have to copy the files separately and do the database backup separately. We can achieve the same behavior with little overheads – by avoiding files creation for certificates. We can use the database records to dynamically create certificate based on the student url. By default the ISAPI handlers, handle the .aspx url extensions. We have to create a new handler for .jpg file handling that would be redirected to our certificate creation code. You can execute the application and see the certificates. The library contains 3 students information. We can add more optimizations to the code like verifying the raw url, customizing the error messages etc. How to Serialize a non-serializable class in .Net? Although we can use BinarySerializer to serialize objects, the constraint is that we have to mark the class as [Serializable]. This could not be feasible as we have to deal with different kinds of objects which contains other types. Use XmlSerializer for the purpose. How to generate a bitmap dynamically in ASP.NET?